We hope you are enjoying your holiday season. We are taking some time off of the blog to recuperate after this fantastically busy season. Thanksgiving and Christmas are always the busiest time of the year for fabricators, but this year was especially busy! We are so grateful for the business and we hope it continues strong into the new year. We will be posting our favorite projects from 2012 until the new year. We'll be back with new posts on January 2nd. This year we had so much fun working with Michelle from the blog 4 Men 1 Lady. 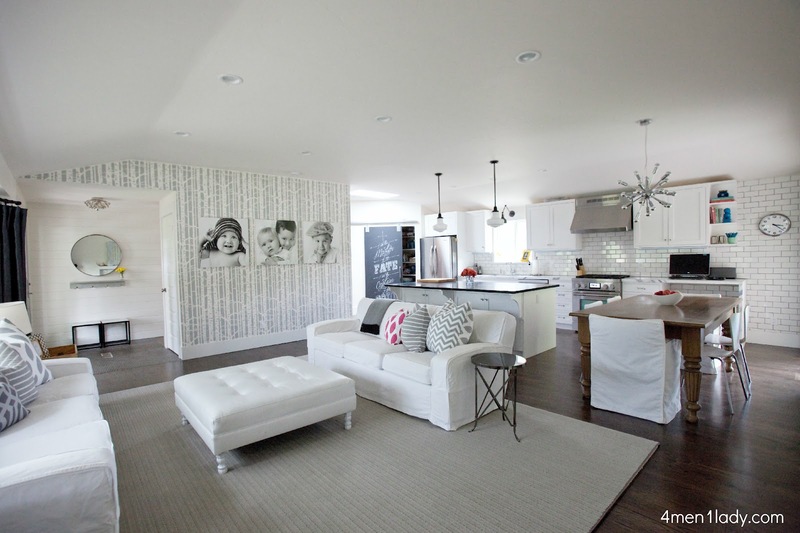 She remodeled an older home here in Utah and did an amazing job! We were so happy to be a part of it. Originally I posted all areas separately, here they are all together. Enjoy! *Kitchen originally posted August 27th. We were so excited when Michelle from 4 Men 1 Lady hired us to fabricate & install her kitchen countertops! Photo by Wondertime Photography. Property of 4 Men 1 Lady. The first time Michelle called me I was totally thrown off. I had asked her the name of her blog and knew who she was because I had been a reader for years....but she said she was in Utah and I thought she lived in Arizona.... So I was quite confused. 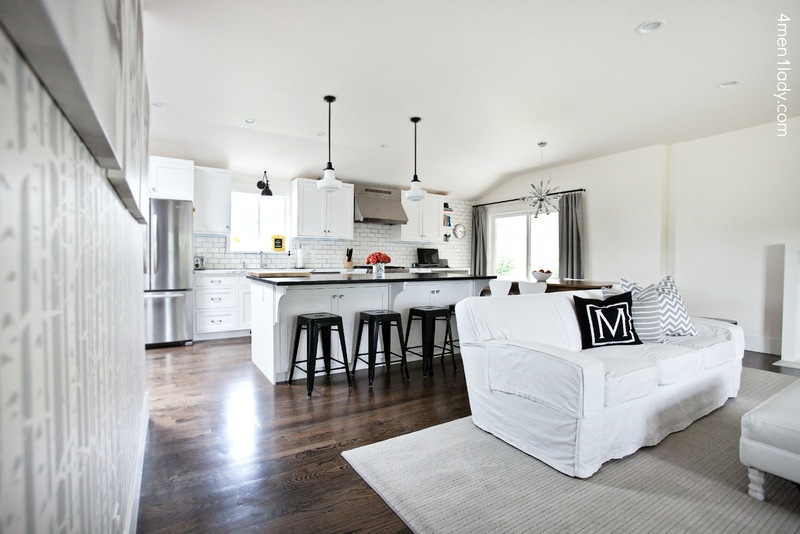 If you read her blog you know Michelle has great taste, if you haven't seen her Arizona home be sure to check it out here. It's colorful, unique and well designed. 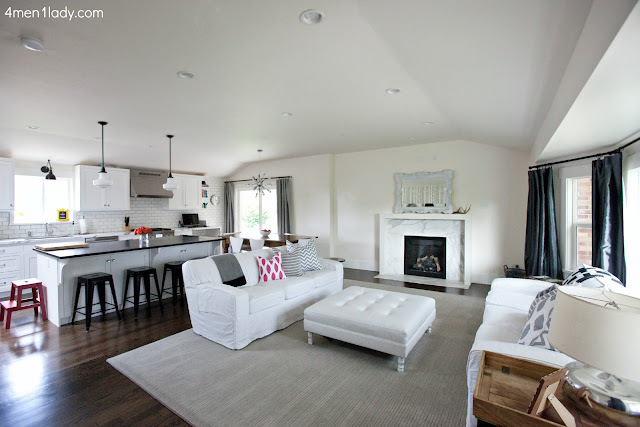 So I knew her Utah home was going to be even more gorgeous and I was excited to work with her. 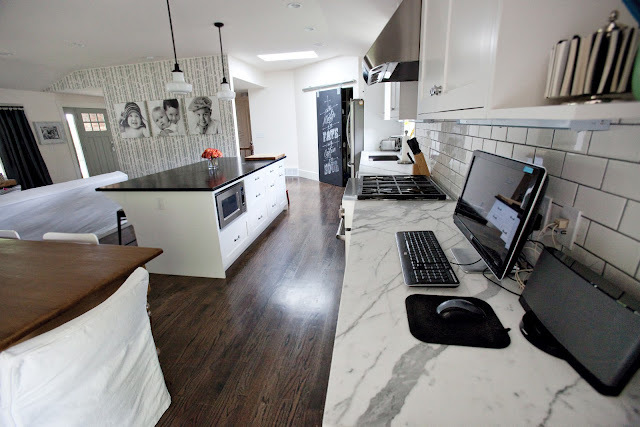 She selected Statuary Vein marble with a Honed Finish for the perimeter countertops and grey Soapstone for her island. Marble and Soapstone are the two types of stones that I get asked the most about. I can talk about them until I'm blue in the face, but it means more when you hear from someone who is living with them. Michelle was kind enough to take some time and answer a few questions about her countertops. Steph: What's your favorite part of your remodel so far? 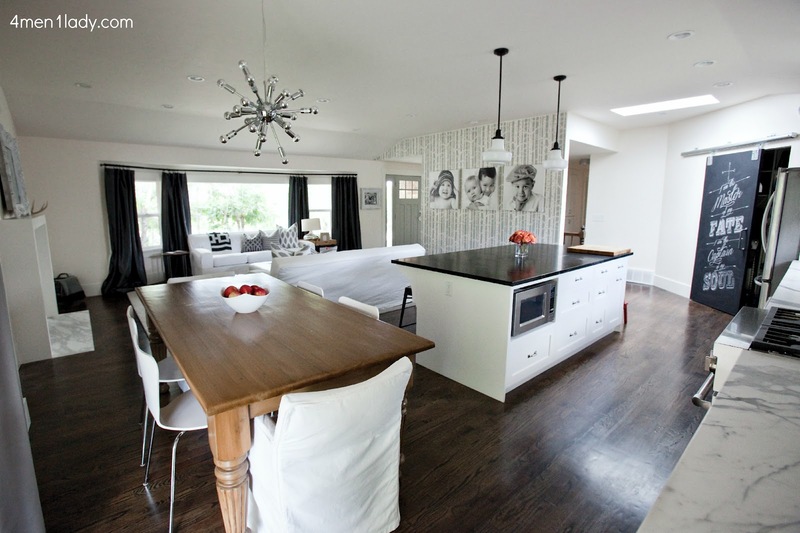 Michelle: I've loved my kitchen so far! Definitely the best thing about it is the layout. There is so much to be said about having your living space be a great room. Everything takes place in the kitchen, living, dining room and as a mother of three busy boys it's great to be able to keep an eye on everyone. My favorite thing about my marble is the Waterfall Edge. It is so dramatic. LOVE IT! Note: The Waterfall Edge is on the end of her perimeter countertop. See photo below. We Mitered the panel piece so that it looks like a thick 1 1/2" piece of marble all the way to the floor. The actual thickness of the marble is 3/4". It's probably my favorite thing about her kitchen too! I'm glad she did it. 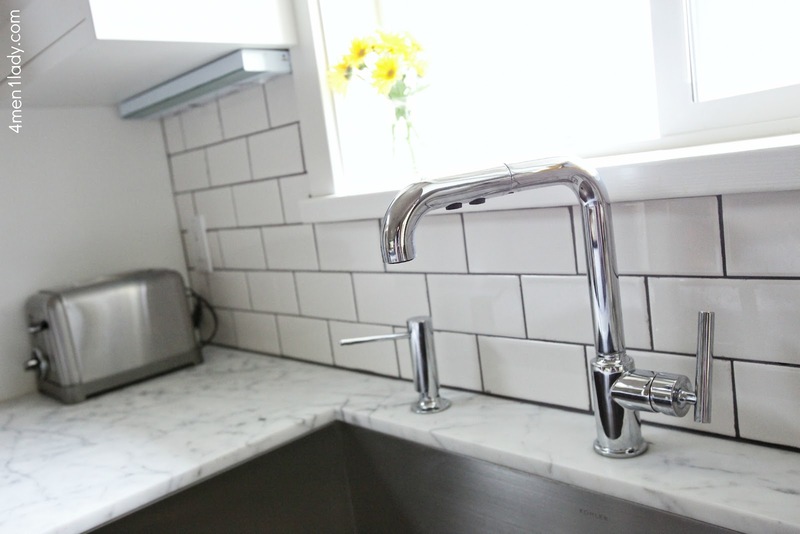 Steph: Do you have any regrets using marble in your kitchen? Does the etching and/or staining bother you? Michelle: Hmm. Good question. To be honest, I'm a little scared of it. I've been warned about how high maintenance it is that I try to avoid using it. I haven't had any etching since I'm SOOOO careful what I put on it. There have been a few times where I've found something like a glob of jelly on the counter and my blood pressure shoots up. But surprisingly it really hasn't stained. We did have a family party and a family member put a greasy spoon on the counter. When I found it I picked it up and noticed that there was a huge grease stain. No amount of rubbing or cleaning could remove it. I about wanted to disown that family member and vow to never have another party again. Stephanie did tell me there was a poultice that could remove it but a few weeks later it eventually disappeared. Thank goodness. Would I use it again? The jury's still out. It is an absolute show stopper feature in my kitchen. Every time I see it I gasp at it's beauty. I knew what I was in for before it was installed and I had prepared myself and my family for the extra TLC we would need to exercise around it. 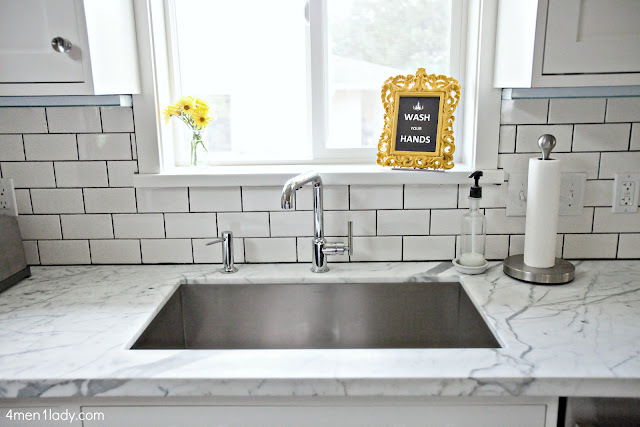 But I do like to entertain and I don't want to feel like I want to disown a family member for leaving a semi-permanent grease stain on my counter and I'm definitely not going to be that crazy women who tells people not to breathe on my marble counters. That's just silly (and insane). I did put it on the perimeter instead of on the island so it doesn't get as much use just as a result of it's location which is great. I LOVE the look of marble. If I were to do it again I might use marble as a backsplash instead. Steph: Any regrets using Soapstone in your kitchen? 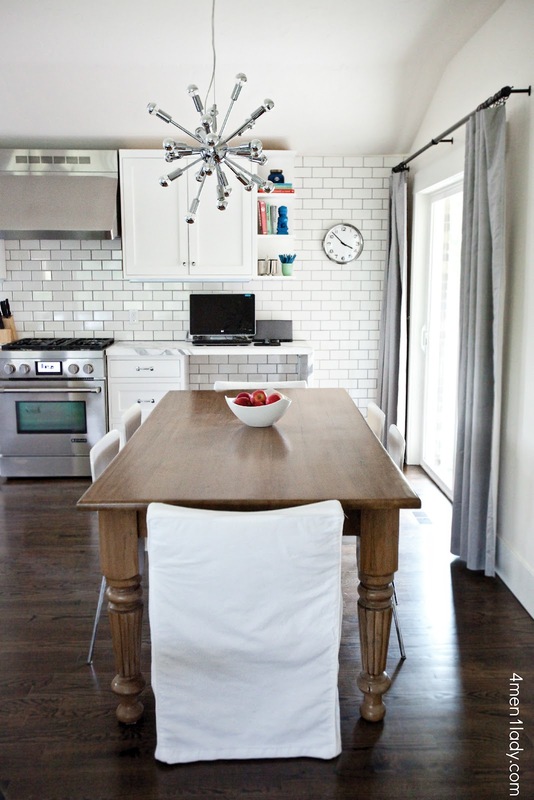 Michelle: I absolutely love my soapstone and would do it again in a heartbeat. It is also high maintenance in the fact that it needs to be oiled occasionally but that is totally optional how often and if you even want to do it at all. I sort of like that fact that it changes it's appearance from different shades of gray and black as it dries out. (Funny because I don't like my marble changing color at all!). It's also a soft stone. My 1 year old has dinged it up pretty good in his spot at the bar but for some reason it doesn't bother me. (Again, ironic because if my marble had dings I might faint). 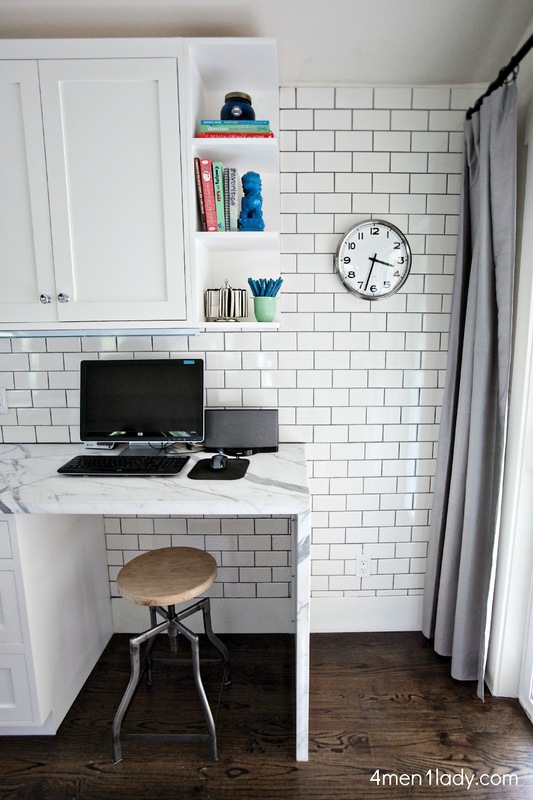 I really fell in love with soapstone when I saw it at the old Restoration Hardware register counter which used to be at Trolley Square. The patina and character of the counter was so lovely. I asked the manager about it and he said they never oil it or do anything to it really. You could see it had a couple of chip marks but over time they soften and just look like character. I was sold then and there. Oiling soapstone is really not that big of a deal. I only do once every four months-ish- and I usually do it right before we are walking out the door for a vacation. That way I don't have to worry about the oil getting all over the place with my boys and it can sit and soak in for days without any interference. The Statuary Vein marble and the Soapstone were both purchased from Italia Granite in Salt Lake City. Cory has a great selection of stone and is fantastic to work with. 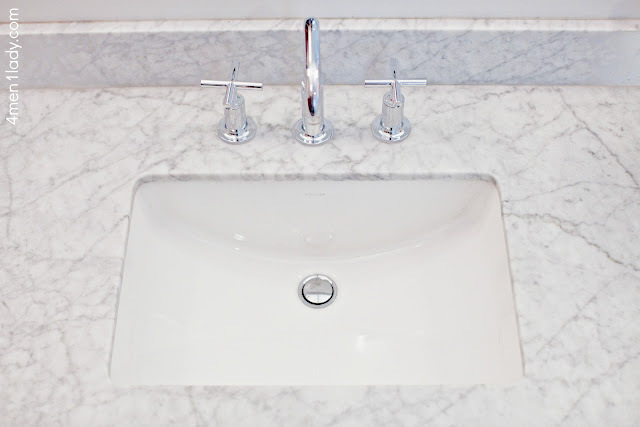 We (MGS by Design) did the honed finish on the marble. Not all shops do surface textures on stone in their own shop. We do and we believe it gives you a better quality product and a better price. I've posted pictures of a couple of other things we did for Michelle in her home previously. If you missed it be sure to check out her gorgeous Calacatta Gold Fireplace here and her Carrara marble mid-century bench here. A big thanks to Michelle for taking time to talk about her new kitchen! She was such a pleasure to work with. 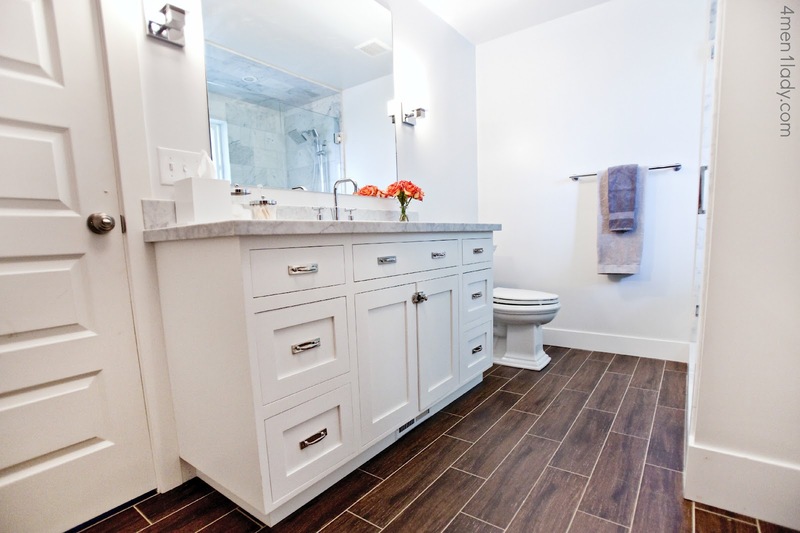 Be sure to check out her blog for more pictures and information about the remodel. *Fireplace originally posted April 2nd. I've been posting updates from Michelle's house (from 4 Men 1 Lady) that we did the countertops and fireplace in recently. Her gorgeous fireplace is now all finished up! You are going to die over the change! After tearing out the rock, here is the 'After'! 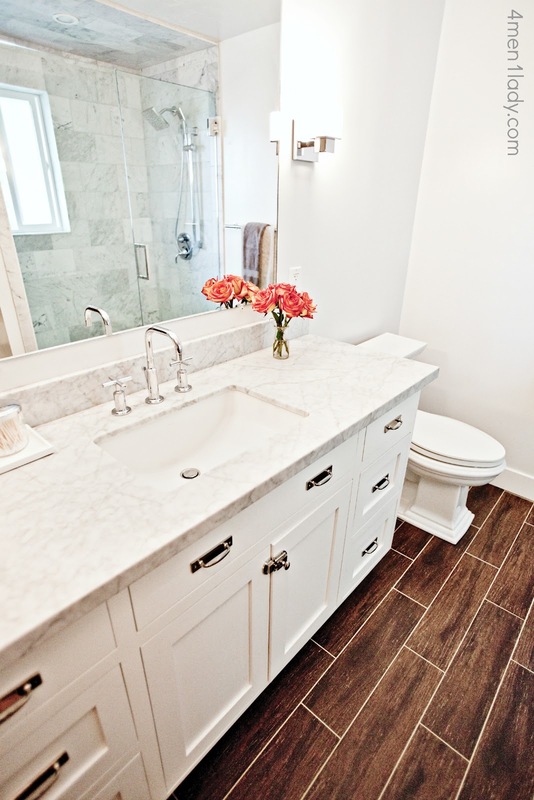 Michelle selected a beautiful slab of Calacatta Gold marble from Italia Granite. We installed all of the marble and then her mantle was installed on top. You can see more pictures of the fireplace here. * Bench originally posted June 25th. Michelle from the popular DIY blog 4 Men 1 Lady, recently had us cut and polish a couple of small pieces of Carrara marble for her. She made a super cute bench for her entryway! Be sure to to her blog to see the Before pictures! *Master Bath originally posted September 24th. Today I have the last installment of Michelle's home (from the blog 4men1lady.com). 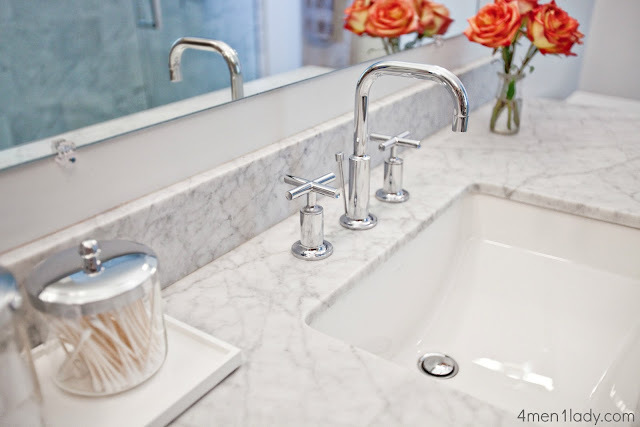 We did the marble countertop in her beautiful Master Bath. This bath was a HUGE transformation. Be sure to check out her blog for the 'Before' pictures. You'll be amazed it's the same home! For the countertop she chose a beautiful piece of polished Carrara marble that we had in stock. The edge detail is the 1 1/2" Mitered edge. I love the rectangle sink. They look great but I also love how they function! Don't forget to go to her blog to see even more pictures of her gorgeous bath!